Sunny and Pleasant, Water temperature 50* and stained. I got out early to catch bait then picked my crew up and went fishing. I concentrated on areas this morning where we had success yesterday. I started off deploying boards on the bank side of the boat when the closest board to the bank started skipping across the surface. Before I could get another bait in the water a second board got hit. I started thinking to myself that my worrying last night of the fish turning off due to a cold front blowing through was in vain. Todd had called many times wondering if we should reschedule the trip due to the weather and after him changing his mind several times at 7 o'clock last night he decided to go today. It actually was a beautiful morning with the sun out and little wind but that did not last very long. It took me a little while to figure out what the fish were doing but once we did we worked on them. I figured out a pattern they were using and every spot that we hit that fit the pattern we caught fish. Kathy had been the luckiest today reeling in the largest fish until Todd hooked up with his big fish. He had fought a nice fish prior to catching this one but messed around with it until it got tangled in another line and broke off as I was ready to put the net in the water. He was having trouble with this other fish and I was teasing him about loosing the big fish of the day but he came through for us and we landed the nice Striper. This family really enjoys fishing and have been clients of mine for many years. Although we have had plenty of great trips in the past this trip will stand out in their mind and as Todd put it what a wonderful Christmas present. take time to remember our loved ones who are ill or who can not be with us this Christmas. PS...A long time Striper fisherman of Lake Anna, Allen Worsky, aka...TRASH CAN... is in the hospital recovering from surgery. We will keep him in our prayers. Cloudy and warm, Water Temperature 51* and Stained. I got out early to catch bait this morning but after a couple hours of throwing I only had 2 baits that I wanted to use so I picked the guys up at 7 and went back out to catch bait. Finally caught a beautiful tankful of bait around 8, located some fish and set up on them. The fog was thick this morning and didn't clear off till around 10 o'clock. Fishing was slow so I relocated to an entirely different area and set out a spread of boards. Once the sun came out of the clouds we started taking hits. For the next couple of hours it appeared when the sun was out the fish would hit and when it was cloudy we didn't. Hopefully the sun shines tomorrow and everyone catches fish. Although it is December 22nd it felt like October with light winds and air temps into the 60's. 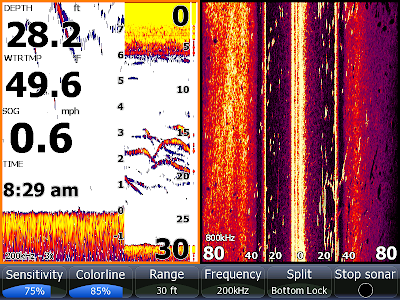 Quite often I receive emails requesting more depth finder pictures with explanations of how to interpret what I am seeing on my Lowrance so that my viewers can understand what they see on their own units. Although I am not an expert I can relate to my experiences of what we catch when I see different scenarios while fishing for Stripers. Last week while on the water I took this picture [lower picture] at 7:50 in the morning. The screen is set up with 3 screens showing bottom lock on the left of the screen set to show from the bottom up 7 feet off the bottom, the center screen traditional sonar in a 30 foot scale and on the right half of the screen side scan set on a 80 foot scale. 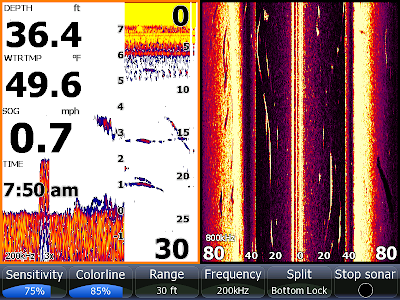 I was looking for Stripers on 30 foot flats at the time and crossed over the channel which was 36 feet deep. I saw a couple arches on the center screen but when I looked at the side scan I noticed actually how large the fish were. I was traveling 7 tenths of a mph and noticing extremely long lines with large shadows out behind them. The boat is at 0 in the top middle of the right screen and fish were showing up around 20 feet with the larger fish showing shadows further out to the side on the screen. In the past seeing lines this size at this speed produced Stripers usually in excess of 8 to 10 pounds. The problem with fishing here is that they are in the middle of the channel, an area where Stripers seldom feed. I continued to search for fish and at 8:30 found a school of Stripers up on a flat where they will feed. After observing the screen seeing smaller fish above the larger fish we put our downlines down to 20 feet immediately hooked up with 6 Stripers at once. After boating the fish I changed my left screen to show the middle of the water column [12 to 22 feet] where I could see the fish more clearly. 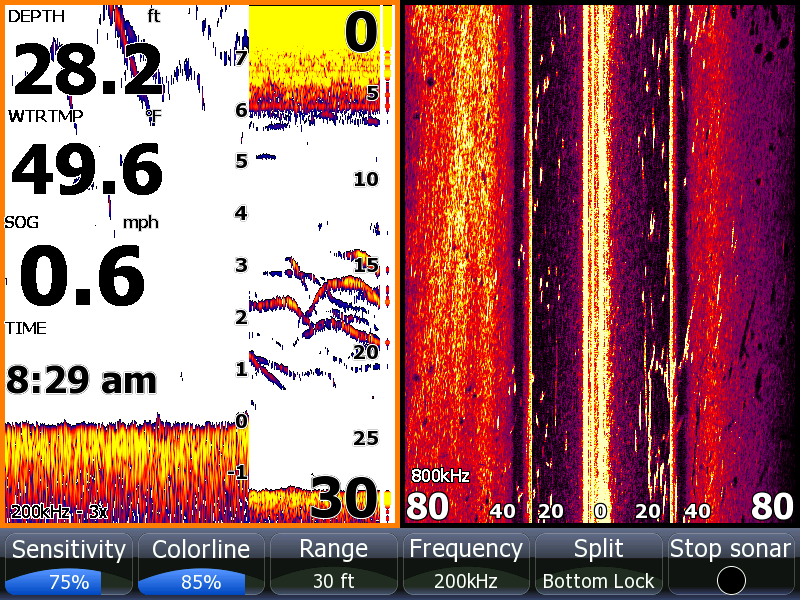 I saw more fish on the right side of my screen so a gradually steered the boat in that direction to stay on the fish. After about 10 minutes of working the school a couple of boats came nearby us with their big motors on and we watched the fish break up into all directions, time to get our baits in and find another school of Stripers! Cloudy and cold, Water temperature 50* and Stained. A friend and I got out early this morning to catch bait then we picked Jeff up at 6:15. We went back out and spent about 30 minutes catching some nice Gizzards then set out a spread of boards and downlines pulling flats nearby the channel. We had no sooner got our baits out when a couple downlines went off. Jeff boated them and before we could rebait boards started skipping across the surface being towed by Stripers. For the next hour and a half it was all we could do to keep baits in the water. I had taken a friend Brian out to do some video filming today. He had his camera running when we had 6 rods hook up all at once. Jeff wrestled all of the fish to the boat without loosing a fish. I guess the action was a little too reveling because before we knew it jump fisherman were all around us. I eased off of the school and popped a couple more a few hundred yards away before the front blew in around 9 this morning. We had caught 21 by then and had enough of other boaters so we got on our big motor and looked for other schools. The temperature falling about 10 degrees coupled with the wind howling made it quite uncomfortable for awhile. The front took its toll, we only caught 5 more fish the rest of the trip. We still were happy catching 26 fish for the day but we were also bummed out knowing that if the front had not come through till later in the day we could have easily doubled our catch. Partly cloudy and Pleasant, Water Temperature 49*to 53* and Stained. Anthony took Vinnie and Shelton [Ferguson Enterprises] along with Greg their Kohler rep fishing today. Anthony and Vinnie got out early enough to catch bait, picked the rest of the crew up at 7 and hit a flat that had been producing some nice fish. After pulling the are for an hour and a half without much action he change tactics and converted to using down lines over deeper water. Before they knew it the action got hot and heavy. By noon they were out of bait so they ate a great lunch prepared by Greg and caught more bait. Anthony wanted to try fishing boards again over shallow flats so he converted back to pulling boards hoping to catch some bigger fish that we know are feeding this time of year. Unfortunately the water is still very stained [6 inch visibility] coupled with the cold water making fishing difficult using this method. Today was a great day on the water, little wind, warm air temperatures and plenty of fish to take home for table fare. Cloudy and Warm, Water temperature 50* and clear. Got a late start this morning, one of the guys got lost so we left the marina around 7. I threw for bait for a an hour and a half, caught enough to get started so I put out a spread pulling shallow flats. After getting 3 baits in the water one of the boards started skipping across the water and after a short battle we had our first fish in the boat. The guys faces lit up with smiles, there was a lot of chatter about maybe they may catch some fish today. Later I found out that some had bad experiences of fishless trips with other guides and some others had not caught fish so large before. We continued to put baits out and catch fish. We fished till about 11:30 taking strikes about every 15 minutes or so. I decided to make a move to collect more bait and hit another area. After throwing for a couple more hours I had what I wanted and tried once again to put a spread out. I had only gotten 5 baits out when we had a double hookup so the guys wrestled them into the boat. The rest of the afternoon was slow, the fish had turned off. I was hoping for a big bite in the afternoon like we had yesterday but it simply did not develop. The guys had a great day and had plenty of fish to take home for the table. Sunny and Beautiful, Water Temperature 50* and Clear. After hanging around the house this morning wishing I was on the water I called a couple of friends to see if they wanted to go out for a couple hours this afternoon. We left my house after 1, put the boat in the water, caught bait and went fishing. Less than 2 hours later we had these fish to show for our efforts. The guys had no smiles on their faces, we left while the fish were still biting because I had to get home to prepare the boat for a trip tomorrow. While we tried to take this picture the largest fish of the day hooked up but it was released to fight again. This afternoon we had about 22 to 25 hits. DP also decided to fish today so he got his son and a friend and headed to the lake. DP is pictured holding up all the fish Anthony caught today. Anthony is holding up his biggest fish of the day and is smiling because he doesn't have to clean all the fish, he has to get ready for school tomorrow while his daddy does the dirty work. There was another picture that I wanted to show but it did not come out very well. I was playing with Anthony on the radio today and after awhile he said they finally caught something, a leaf. We all had a good laugh but he got the last laugh of the day, he caught more fish than we did! Sure is great to see kids enjoying the outdoors. If anyone would like to book a trip with little Anthony, let me know and I will set it up. You have to supply the boat and gear, he will tell you what to do and where to go.